Self-driving cars are usually limited to well-mapped, predictable road systems, and often use 3D models of neighbourhoods to help them find their way. That's fine for urban areas, but no good when you need to travel off the beaten track. To solve that problem, researchers at MIT's Computer Science and Artificial Intelligence Laboratory (CSAIL) have developed a navigation system that lets autonomous cars navigate roads less traveled. The system, called MapLite, uses sensors that detect the road condition, and combines that input with simple GPS data. 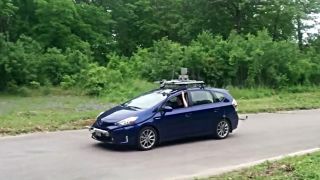 In tests with a modified Toyota Prius kitted out with LIDAR and IMU sensors, the team were able to drive on several unmarked roads near the lab in Massachusetts and predict the route up to 100 yards ahead. "The system first sets both a final destination and what researchers call a 'local navigation goal', which has to be within view of the car," the team explained. "Its perception sensors then generate a path to get to that point, using LIDAR to estimate the location of the road’s edges. MapLite can do this without physical road markings by making basic assumptions about how the road will be relatively more flat than the surrounding areas." Although real-world implementation is still a long way off, it's hoped that MapLite could help open the potential of self-driving cars beyond cities and highways. “I imagine that the self-driving cars of the future will always make some use of 3D maps in urban areas," said CSAIL graduate student Teddy Ort. "But when called upon to take a trip off the beaten path, these vehicles will need to be as good as humans at driving on unfamiliar roads they have never seen before. We hope our work is a step in that direction."